so I have decided to only show a limited amount of designs on the website. However, if you are interested in seeing more motifs, please contact us. Artwork made of magnetic panels that you can rearrange & layer to create your own vision. 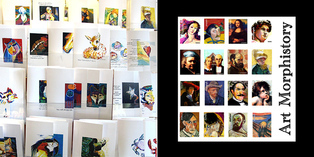 Become an art patron & collector... who knows when Jay's inventive juices will be running out.